Well, its Monday again, which means its time for another wonderful Monday gastropod. Behold, Polymita picta, the painted snail. This beautiful land snail is a pulmonate, which means it is part of an illustrious group of snails and slugs that have acquired the ability to breathe the air with lungs instead of gills. This particular pulmonate is native to Cuba, and can be found nowhere else. 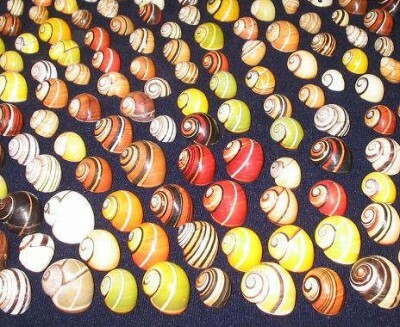 Perhaps the most splendid thing about this species of snail is it's incredible diversity. As you can see, the range of colors these creatures produce is truly inspiring. Unfortunately, this beauty brings these lovely animals to the attention of humans, who often kill snails and make ornaments from their shells. It is sad, really, that our species can't just appreciate the wonders nature produces. There will always be those who would rather destroy something to possess it than let it go free and retain it''s natural beauty. And so I leave you with a final image, that of an intact snail making it's way through the leaves of it's home. Marvel at the beautiful structure it has labored it's whole life to produce. I don't know about you, but I am happy to leave it where it is. Thanks for the appreciation. I'm always glad to see people enjoy the knowledge I have to share. Thank you for sharing this Jason. They are so beautiful. I too wish humans would let them be in their own habitat.